Are you feeling a bit meh about your hair lately because your hair care products keep falling flat? 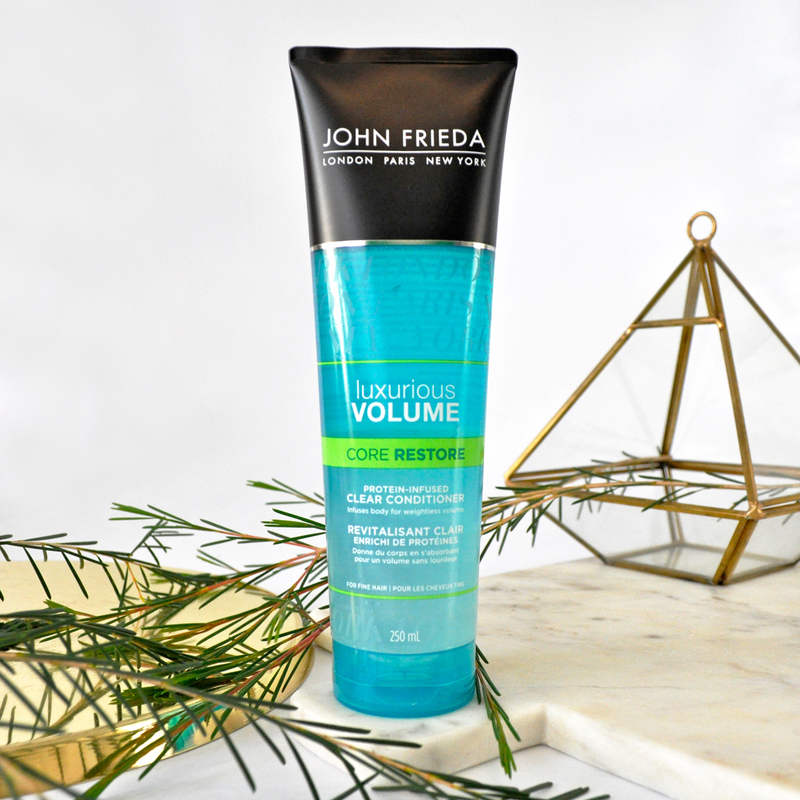 Well you can now say goodbye to spending hours on curling and teasing your hair because John Frieda’s Luxurious Volume Core Restore range has got you covered! The Protein-Infused formula is designed to create bounce and breathe life into lackluster protein-deficient hair, giving your locks impressive body and volume! 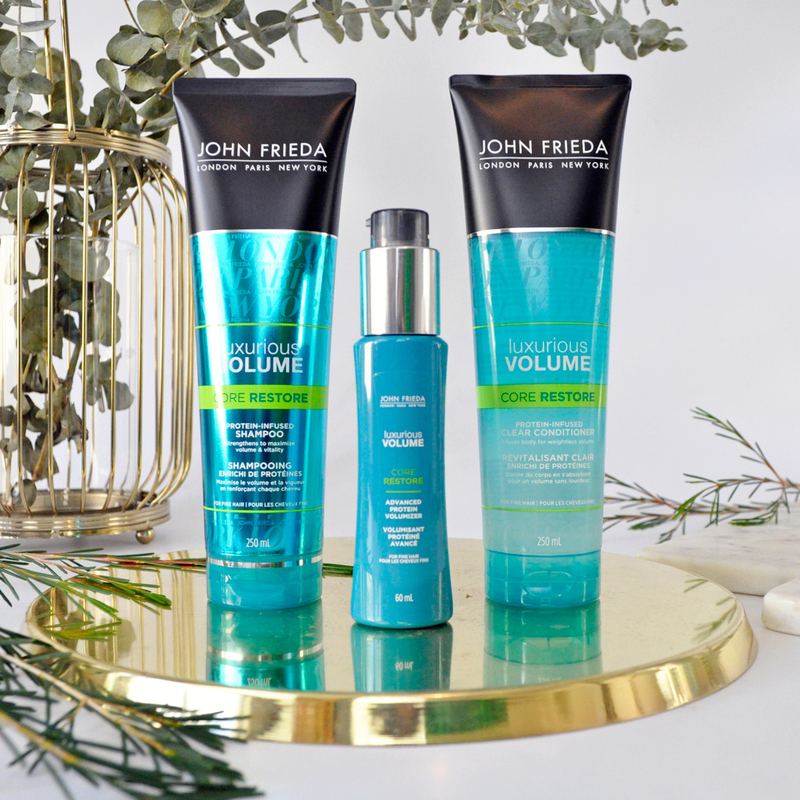 These three core restore volume boosting products are ideal for fine and colour treated hair, they impart a shine and weightless nourishment like no other. I start by gently massaging the Luxurious Volume Core Restore Protein-Infused Shampoo into my wet hair. It cleanses and lifts strand with volume polymer for added body, and effectively acts to create space between hair fibers for volume building strengthening care. This shampoo scent is divine, it lathers well and leaves my hair soft, healthy and smelling nice and clean. Strengthen fine hair to maximise volume and vitality. Core Restore Shampoo with Protein-Strength Complex, brings protein-deficient hair into balance by unlocking a new level of touchable volume. I then follow with the Luxurious Volume Core Restore Protein-Infused Clear Conditioner. The clear gel formula is free from heavy ingredients, such as fatty alcohols or heavy silicones. If you have fine greasy hair, apply a small amount to avoid over conditioning your hair and mainly focus at the ends of the hair. I always rinse really well to get rid of buildup so it’s never left flat or lifeless. 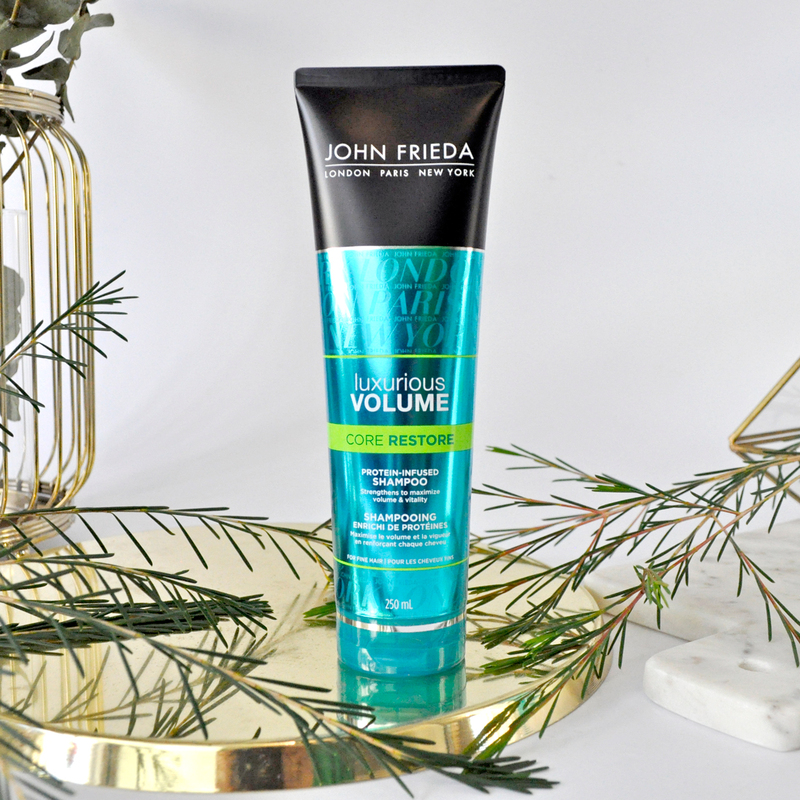 Unlike traditional conditioners, John Frieda Luxurious Volume Core Restore Conditioner features an innovative, clear formula with Protein-Strength Complex. Without heavy ingredients, it detangles and weightlessly absorbs into hair without coating it. For hair infused with body and strength for a new level of volume & vitality. I like to finish my haircare routine with the Luxurious Volume Core Restore Advanced Protein Volumizer. Applied to wet hair the formula penetrates and forms temporary bonds between the hairs natural protein chains, to minimise breakage and build strength. My husband and I have been using these three products together for over a few weeks, he’s noticed his hair has extra volume and the best part for me is I have less hair fall out. It feels stronger, smoother and stays cleaner for longer. We are both loving this much needed healthy bounce and shine! 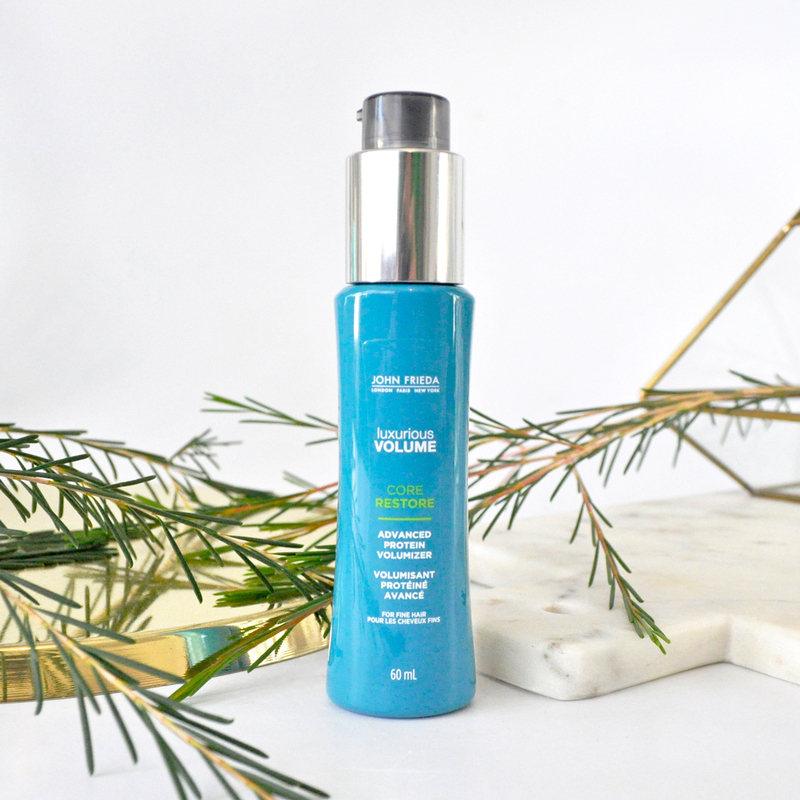 Weightlessly transforms fine hair from within. Maximize volume & vitality with each use with this heat-activated volumizer, with Protein-Strength Complex. Progressively strengthens the hair fibre for long-lasting, natural-feeling style. Directions: Dispense 3 pumps of product and apply to washed, towel-dried hair. Use more or less depending on hair length and thickness. Comb through to distribute. Do not rinse out. Blow Dry to activate. Then style as desired. Use each time you wash your hair. 2x the strength and 2x the volume! 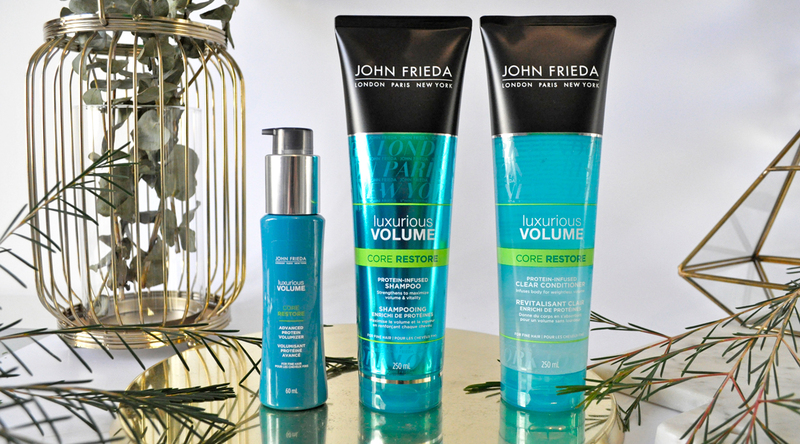 Have you tried John Frieda’s Luxurious Volume Core Restore range yet? Which hair care products do you swear by? Give us some recommendations in the comment section below. These products are available from April 2018 at Woolworths, Priceline, Chemist Warehouse, independent pharmacies and select retailers nationally. Head over to johnfrieda.com.au to find out more about their extensive range of hair care products. You totally should 🙂 Please let me know what you think when you try it! Thanks Cat, John Frieda make amazing hair care products. 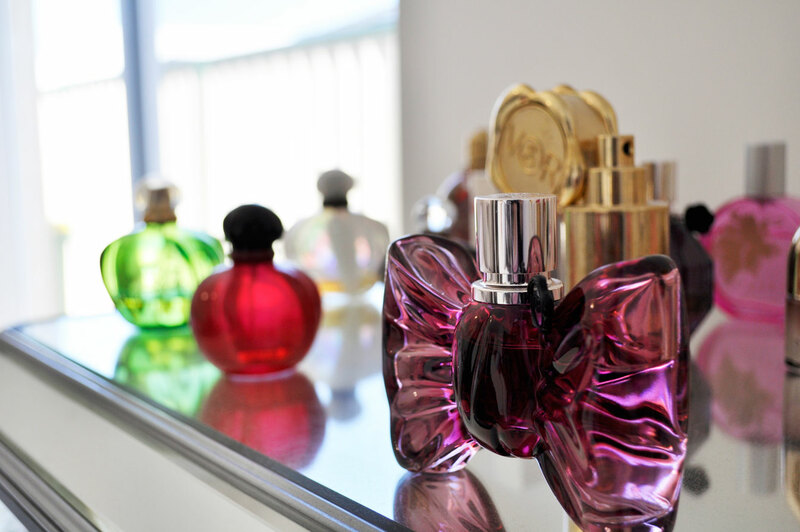 I am loving this range atm! Me too 🙂 These hair care products are brilliant! My hair needs some voluminous oomph and this sounds perfect! I am always super impressed with John Frieda’s hair care products! Thanks Jessica, They are awesome! I love that it’s not just a volumising hair care system, but also treats hair to be fuller and thicker. Might be one to consider after I finish my Mr Smith hair products! I’ve been loving these products lately too! So good for fine flat hair like mine! To be honest my hair is so thick I don’t really need volumising products, but I’m glad these worked out for you! I love volumising hair products. My hair is quite thin so it definitely helps give my locks new life! I am really enjoying this collection atm! I love how the conditioner is a gel consistency! It’s so weird how it is clear though!